“On Sept 1939 our country was at war for almost 6 months. I joined the army on the sixth of June with the Queens Own Rifles of Canada. We went to Newfoundland and guarded Gander airport and the sea port of Botwood. After six months there, we returned to Camp Sussex, New Brunswick. We trained there until July 1941 when we sailed off to England. We trained in south of England mostly route marching and assault courses and power marching. We did amphibious training in the English Channel and land exercises for several months leading up to the D Day landings. We also trained in a lake in Scotland in the estate of Duke of Argyle. It was a very calm lake and much easier to train compared to the English Channel where many of us became sea sick. About a week before June 6 (D Day) we moved to camps near South Hampton, moving from camp to camp. Everyone was confined to barracks on the final week before we boarded the boat, no one was allowed in the camp or allowed out. We boarded the boat in the morning of June 4th 1944. The landings were scheduled to take place on the day of June 5th but due to bad weather the landings were postponed and we spent that day and night on board the ship. The weather cleared on the coast of Normandy and it was decided to try for a landing on June 6th. On the morning of June 6th we had 4 am reveille and a good breakfast right away of bacon, eggs and coffee. By 5 am we were lowered down into the boats. Part of Baker company was lowered down by platform, the rest of the company were not so fortunate as we had to climb over the rail down a thick rope ladder into a small landing craft which was tossing around in the water. The British Marines tried to hold the boats steady as they could as we climbed down the ropes with full equipment: A rifle slung over our shoulders, Bren gun magazines in our pouches in our web equipment. We also carried grenades, water bottle and a haversack on our back all weighing approximately 100 pounds. Each man took their place on the bench (30 men or so). I was the last man on the boat along with my platoon officer Hank Elliot and Sgt. Frank Gaines. By 6am we were away towards Normandy. The water was choppy and rough and wasn’t long before most of the men got sea sick in the “barf bags” provided that were thrown over the side of the boat. By this time we were a couple miles from shore around 8am when we sighted land. We were uptight but steady as we headed towards shore with not a sound or movement to be seen or heard. It was almost like doing an exercise in our training on the beach in England but we knew different. As we approached the shore the boat circled then landed in a row of 10 boats ‘A’ company on the right, Baker on the left. We made our run in, in line and as we were going in there was a “swooshing’ sound. I looked up in the air above I saw rockets flying towards the beach. They had a very high trajectory. The first casualty we saw that day was a Spitfire flying low parallel to the beach. He flew into the barrage of rockets and immediately burst into flames. All that was left was small fragments. It was a terrible sight. As we got closer to the beach the marines revved their engines but our boat was on the left flank and had a damaged ruder. We drifted and landed on the extreme left flank. We ran aground and the ramps went down and we ran off the boat in hip deep water. Most of the platoon made it to the wall. I ran across the beach up to the wall passing one rifleman that was wounded. We were told not to stop on the beach to help anyone. I got up to the wall and I looked down to see carnage on the beach. I saw boats blown up and damaged and men lying on the beach and men struggling to get out of the water and run across the beach. Our Corporal Bill Dainty was lying there gasping for breath so we propped him up against the wall and he died almost instantly. “Stumpy” Gordon ran along the wall with a flame thrower towards the pill box where the Germans were. He aimed the flamethrower but it didn’t work, all that came out was a small “squirt” of flame. He threw the flamethrower down and came back along the wall. A shout went up “down here, there’s a hole in the wall”. Our Sgt. Frank Gaines called us to follow. Sgt. Gaines and our Lieutenant went through the wall first when suddenly there was an explosion. We thought our Lieutenant was gone. There was dust and debris blown up and when it cleared away our Lieutenant ran down the wall and the Sgt. and the rest of the platoon followed. Abby Emlaw and me set our Bren gun up on a high sand dune and gave covering fire to the rest of the platoon as they made their way along the back of the wall. They took prisoners and kept going through small buildings about 100 yards further as Abby and I joined them with our Bren gun. Later when everything was settled, our Lieutenant said we had another job to do so we made our way down the beach and discovered a large artillery gun on the shoreline. The German crew had abandoned the gun and ran back inland about 100 yards in a slit trench. We lay on the sand dunes and fired several rounds into the trench. One man jumped out and surrendered and the rest of the crew followed approximately 6 soldiers. We returned back to the beach area and got a full realization of our losses. The beach was a blood bath of fallen soldiers. Lieutenant Elliott and Sgt. Gaines gathered as many men as possible and we marched off towards our objective which was the village of Anguerny Heights about 10km. When Sgt. Frank Gaines called the roll that night, only 19 out of approx. 130 soldiers of ‘B’ company answered the roll. That was our longest day and my luckiest day. My brother Cpl. George Hadley was also in Baker Company. He was 2 boats to my right and suffered extreme heavy fire. His boat was blown up, turned sideways into the shore but he jumped into 6 foot waters and managed to swim to the shore. He was lucky that day but his luck ran out about a month later when he was killed on patrol on a night mission. Our next action our regiment was involved in was at a town called Le Mesnil Patry where Company D was ordered to attack with Baker Company. Baker Company was held in reserve along tall hedges at the edge of a field. D company attacked with the aid of several tanks as the Germans were dug in prepared and ready. D or Don Company was almost wiped out and there were only about 20 soldiers that came out. One platoon managed to outflank and kill a few Germans. The next day Sgt. Major Charlie Martin entered the field and found several Queens Own soldiers murdered, shot in the head. This is where our first evidence of an atrocity occurred. This was a very cruel and dreadful day that will never be forgotten. 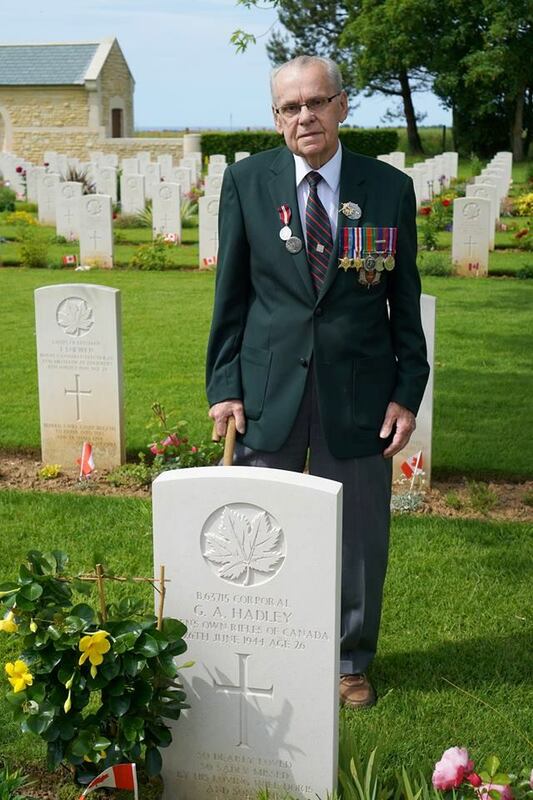 Rifleman Jack Hadley at the grave of his brother. Later we were dug in at a village called Rots where I lost my brother when he went out on a night patrol and never returned. When I went to see him, he was already buried. He rests now in Beny- Sur Mer, France. We moved up to Carpiquet Airport where there had been heavy fighting. The North Shore Regiment and the Chaudiere’s had suffered heavy casualties at the airport. We relieved them on July 5th and had a very rough time losing several men, most to shell and mortar fire. It was a real hot spot. We moved out toward Caen on July 9th and came into heavy shelling as the enemy knocked out a Bren gun carrier and 2 tanks. We took cover in the trenches and stayed there until the next morning that was a dull overcast day with very poor visibility. I heard a slow moving German aircraft overhead, then suddenly a screaming noise and a bomb exploded with shrapnel spreading across the field and pieces of shrapnel hit me in the side of the face and neck and went through my left shoulder, entering and exiting. I was bleeding badly and my buddy Abby told me I better get back to the RAP (Regimental Aid Post). On the way back the shelling started again and I dodged several bullets in and out of slit trenches. I saw the M.O (Medical Officer) and passed out. When I came to, I was on a stretcher being evacuated back to England, the second luckiest day of my life.